At first glance, Jessi Reaves’s sculptures look like abandoned furniture waiting to be reupholstered: out of order, innards outward. A closer look reveals a careful arrangement of materials that have been quilted, bound, and glued together to create objects that are at once surreal and familiar. The sculptures override historically imposed lines between art, design, and craft. Reaves integrates ready-made objects into her constructions—chairs, car fenders, shop fans, lamps. Her sculptures function as both utilitarian objects and representations of utilitarian objects. She references (or includes) classic modern furniture designs by household names: Isamu Noguchi, Philip Johnson, Marcel Breuer. Assembled in a gestural, almost painterly fashion, the sculptures evince a funny sense that Reaves has set free a decorative subconscious that once lay bound within the forms. Without making any overt reference to the body, her sculptures manage to feel oddly human, which contributes to the works’ strange, ineluctable attraction. Uncanny upholstery, slipcovers, and drapery techniques give the work a corporeal presence. (After graduating from RISD in 2009, Reaves worked in upholstery.) It seems natural that her work has been linked with art-leaning circles in fashion. Reaves has collaborated on multiple occasions with RISD classmates Mike Eckhaus and Zoe Latta of Eckhaus Latta, and with John Galliano, creating a centerpiece installation for the Maison Margiela’s 2018 spring couture show in Paris. 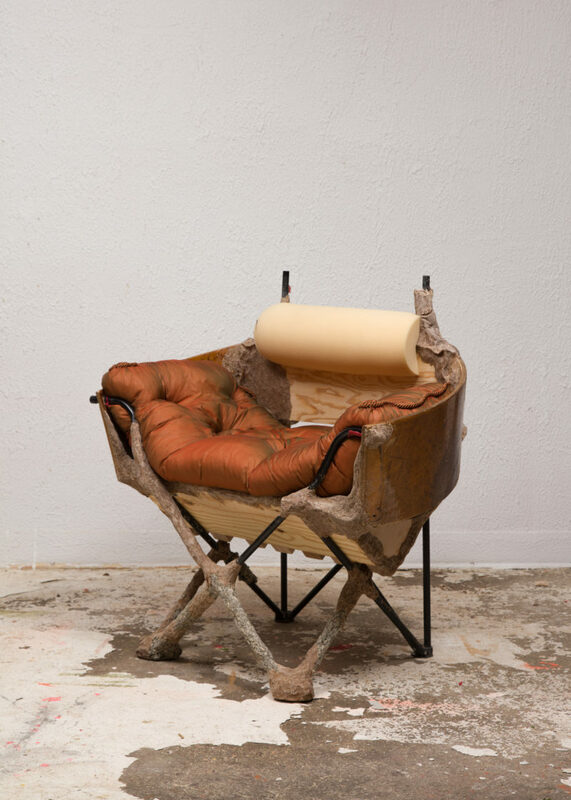 I met Reaves in her studio in Chelsea, in Manhattan, situated in what was once the stable of an old carriage house, to discuss her process and her piece Crust Bucket Comes to Town (Slipper Chair) (2016). THE BELIEVER: For Crust Bucket Comes to Town, did you start with a sketch of a shape or form and then look for the materials that fit into that idea? Or did you work based on the materials you had at the time? JESSI REAVES: It’s definitely different from piece to piece, but with this one I had the materials. Or at least half of them. The main element to start with was the frame of a collapsible camping chair. I actually had that frame only because of a collaborative piece, a table called Crust of the Lake, that I made with a friend, the artist Robert Bittenbender. He was using this camping chair as the chair in his studio and it had ripped in the seat. I went to his studio to talk about our collaboration and was completely sidetracked by this thing he had done to repair the chair. He had taken barbecue skewers, like the wooden ones you use to make shish kebabs with, and he had poked them through and woven them into the seat of the chair using duct tape. We ended up taking the seat part off of the chair and using that in the table we made together. So it was almost like framing this psychotic upholstery. When I was leaving with that piece, he was like, “Do you want to take this frame?” So then I just had it in my studio. Once you remove the seat part, the frame had such a strong relationship, geometrically, to a lot of modern and postmodern chairs. I liked the idea that the chair had been designed so that it could be transported. It’s collapsible, so I wanted to make something really heavy and permanent feeling out of something that was meant to be transient and nomadic. BLVR: The work feels expressionistic and fast, but I know the construction takes much more time than meets the unknowing eye. How much of the process of physically constructing the work is you carrying out premeditated decisions, and how much of the process is made up of more gestural, uncalculated decisions made as you construct? BLVR: The disparate combination of materials lends a sense that the chair’s components have been scavenged. Where did you look for the ready-made materials in this piece? Do you go on material-sourcing journeys? The frame, as you know, is a ready-made, which I got from Robert. These curved pieces of wood were the backs of auditorium seats, but they’ve been cut in half so they aren’t recognizable as ready-mades so much. They still have the texture of having been banged around. I found the cushion on eBay. I’m often searching for things there. I covered it in another fabric so it’s kind of a fake upholstery. The foam bolster is a stock shape. I’m constantly sourcing materials. I really enjoy that part of my practice because it allows me to get out of the studio and out of the city to look for things. I never find what I set out to look for, which is always nice. Then I can search for very specific things online or in auctions. BLVR: Unoccupied, this chair almost feels like a stand-in for the human body. It takes on this strange subjecthood and moves away from its status as an object. The title, too, suggests personification. When you were constructing this piece, were you thinking about creating a character or persona? JR: I always have musician friends coming to town, and that’s a derogatory term, to call a musician a “crust bucket” or an “oogle.” But I’m not referring to a friend in particular! It’s a bit of a joke with myself about the work too. As I mentioned when talking about the base, the chair is supposed to be a travel chair, something you’d take camping. I wanted the transient nature of that ready-made object to be represented in the title. I think one of the most interesting ways the pieces come to relate to the idea of the body is through the notion of blemish, and I think a reason why people see bodies in the work or tend to personify the work is because it embraces the blemished surface. This piece has a crusty skin. JR: Yes, to this imperfection. Fear of blemish is an interesting idea because it expands to different areas. We have these anxieties about our bodies, and I think they’re, in part, a response to the perfect, clean surfaces around us. It’s funny, because the parts of a body are automatically referred to in the language we use to talk about furniture—the leg of the chair, the arms of a chair. I’m weirdly cautious about replicating actual body parts, even though that’s something I love in other people’s work. I love it in Sarah Lucas’s work, Paul Thek’s work. It’s something I admire and am drawn to. BLVR: In a documented conversation you had with Gaetano Pesce, you said that while working on a piece you try “to almost take all of the practicality out of an object and then try to put it back in. Even if the function isn’t as generous, there’s something else that’s happened.” Do you think you can try to articulate what that “something else” is? JR: I think the simplest answer is that that “something else” is the art or the feeling of the piece. When you make something less functional than it has to be, that’s part of what makes it art. Once something is taken apart, it becomes a bunch of gestural items or a group of pieces that have individual gestures within them. At the same time, when something is broken down, it starts to feel tied to different aspects of the manufacturing. You’re, in a way, reversing the production process to call attention to it. To return to the chair, the functionality of the camping chair was that it was lightweight and portable, and that’s been taken away in this piece. It’s now incredibly heavy. There’s so much solid wood under the seat that doesn’t need to be there, at least in the sense that you don’t see it unless you get under the chair or get curious and lift the cushion up. It’s very sturdy. BLVR: Do you ever find yourself having to sacrifice certain creative decisions for reasons related to the functional aspect of the work? JR: I haven’t had to do much of that, luckily. I think I just naturally tend to want to add more structure. Although that definitely did come up with my work at the Whitney. BLVR: Actually, I recall going to the Biennial right after it had opened and seeing a piece of yours appear one way, but when I returned toward the end of the exhibition’s run, I noticed some wear and tear. It made me think that, in a way, the process of the piece continues after it leaves your studio and enters the world, seeing as how, with each use, it’s in some small way altered. JR: It was definitely a crash course in the realities of a big museum and the massive numbers of people passing though. I’d be fine with showing them in the future and not allowing people to sit in them, because I don’t think sitting in them is entirely integral to understanding them or exploring them as objects. The fact that they’re intended to be used is what’s important. There is a range of uses for functional items. They’re not all intended for the same type of use. I tried to approach showing in the museum as though it was going to be an experiment in accelerated aging, like sandblasting. It did become a time burden to go in and repair them. There was a bit of frustration because people were pretty aggressive with the pieces, which wasn’t the point. BLVR: People have been trained not to touch art, but as soon as they find out that it’s OK to interact in a physical way, you open the floodgates and can only hope someone doesn’t abuse that. JR: It’s really true, and I’m still figuring that out. I don’t want to say, Please sit, but I also don’t want to say, Do not sit. I’ve found the best way for people to come to sit is through their natural curiosity, which leads to a more conscious experience with the piece. That is more successful at a smaller museum or exhibition space. You know, earlier you asked about creative compromises, and I don’t know if I’d be compromising something, but there are definitely things I wouldn’t do again if I had known the context was going to be that intense in terms of how people were using the work. I might use different fabrics or materials, but I know I can always find something that fits my intention. I thought of putting a vinyl slipcover on a piece—you know, having it be like one of those bars where they just hose it down at the end of the night. BLVR: Slipcover it all! My great aunt’s house was just about 100 percent clear slipcovered. It was all done in the 1970s and nothing had changed. JR: I love that gesture of the clear covering, but I hate that it has to immediately refer to an old person. Young people aren’t slipcovering their stuff. Nothing we have is worth saving. Eliza Barry is an artist, writer, and musician born and based in New York City.